I think this looks so much like True Bias Sutton Blouse and just make it with two fabrics. I love this idea! You might have to add an opening in the back for the tie to be center back. Thanks so much for the information on Style Arc from last week's post, I appreciate it so much. Your blog made the top 100 sewing blogs in the world on a UK fabric site, Funkifabrics. Congrats! 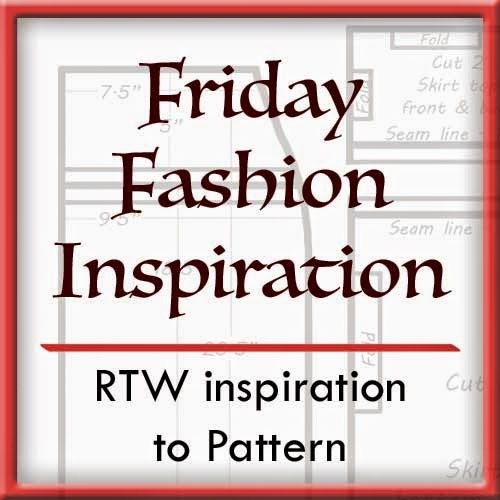 Lori, I LOVE thes Friday inspiration posts. I read quite a few blogs right now since my sewing time is practically nil, and your Friday piers are hands down my favorite. I appreciate all your work and thank you!